In commemoration of the Bangladeshi genocide that began (sort of) on March 25, 1971. The birth of a nation is often (always?) violent. In many cases, the groups fighting for their freedom succeed, and in many other cases, they don’t. In the case of Bangladesh, they succeed, fortunately, but at the expense of so much violence, so much loss, so much destruction. And a genocide that it looks like only Bangladesh itself remembers while the rest of the world denies it (like Pakistan, even though Pakistan committed it) or doesn’t remember it (everyone else). The genocide in Bangladesh wasn’t the first (or last) that Pakistan is guilty of. The first form of any violence that Pakistan committed inside its new borders was against Pashtuns in Babarra, Charsadda, on August 12, 1948. Like the genocide against Bangladesh, Pakistan denies all the other violence it has committed and continues to commit against people, both inside and outside its borders. Like Shias, Ahmadis, Balochis, Pukhtun, … and the list goes on. What had happened was, Hindustan split into two nations: Pakistan and India. Pakistan included West Pakistan (current-day Pakistan) and East Pakistan (current-day Bangladesh). East and West Pakistanis were separated by India, and stuff just logistically made no sense, you see. But it also made no sense for other reasons, like the cultural differences between Bengalis and Pakistanis, and Bengalis wanted their own state. It wasn’t fair for a lot of other reasons, too, including, for example, the fact that East Pakistan was creating some 59% of Pakistan’s exports but was receiving only “25 percent of the country’s industrial investments and 30 percent of its imports” (as cited here). Then, of course, Urdu became the national language when less than 10% of East Pakistan could barely speak Urdu. And apparently, the elites of West Pakistan thought they was the best of God’s creation and thought the East Pakistanis inferior in all ways (then again, elites tend to do this everywhere, so). It looks like the last straw for Bengalis was the Bhola Cyclone of November 1970, which killed between 300,000 and 500,000 people in East Pakistan, and Pakistan hardly attempted to help the people – despite having the resources to do so. This was the deadliest cyclone in history. Read about other reasons for Bangladesh’s demand for independence here. 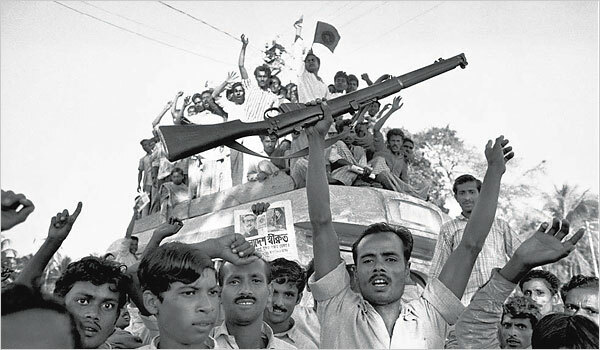 East Pakistan responded by calling for civil disobedience on March 7, 1971; March 7th is also when Rahman officially announced that East Pakistan demands independence. Rahman and Yahya Khan hung out to discuss the matter and supposedly reached an agreement, except that on the night of March 25, everything that could go wrong went wrong: the genocide began. Rahman was arrested–by Yahya Khan at the request of Zulfiqar Ali Bhutto–and placed in solitary confinement in West Pakistan (he was released and returned to Bangladesh, in 1971, after Bangladesh won its independence). On the 26th, 60-80,000 West Pakistani soldiers (who’d already been occupying East Pakistan for several months) started a massacre that later became known as Operation Searchlight. The purpose was to stifle the Bengali quest for independence within a month, though the last city was fallen in mid-May. Intellectuals, students, politicians, and other civilians were murdered throughout the whole time the operation was taking place. Before the operation began, “all foreign journalists were systematically deported from Bangladesh.” However, Pakistani journalists were actually invited to report the crisis but with the purpose of showing what West Pakistan’s capable of doing to those who challenge its establishment. I think this is how we know that, for instance, “the Awami League [Rahman’s party] supporters had massacred tens of thousands of civilians whose loyalty they suspected, a war crime that is still denied by many today in Bangladesh.” Eight journalists were given a tour of the area and were supposed to report what they were told to report, but one of them refused. His name was Anthony Mascarenhas. He and his family fled Pakistan before he could write a story on the event. This entry was posted in Death to patriarchy, genocides, human rights, Pakistan, social justice, violence in this world and tagged genocides, Pakistan, violence against women. Bookmark the permalink. Graana orbala khoray, can you please elucidate the babarra massacre. Suppose i could use the information in an argument. Sure – the link is there (hyperlinked). I’ve written about it on my blog already.